Little Tree Fawn: With the fashionable Lassig Trolleys kids their vacation eagerly in order to pack their belongings and go on a trip. 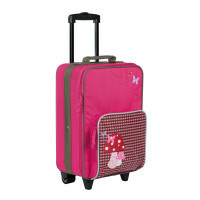 Product information "Trolley, Little Tree Fawn"
description & equipment Time for vacation! 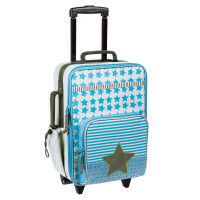 Clothes can be neatly packed in the suitcase's main compartment and secured with the two securing straps. Additional space is offered by the outer front zipper pocket. Everything has its place—including shoes. The practical shoe bag completes this travel set. The outer front zipper pocket and the outer side pocket provide additional space. 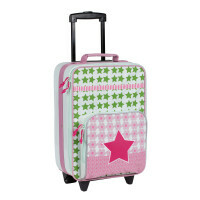 The rolling suitcase includes a convenient two-position adjustable handle. A small clear name badge sleeve is also included to ensure that the rolling suitcase won't get lost. Various designs are available. The Cars navy and Dino slate models are equipped with an additional reflector on the outer front pocket.